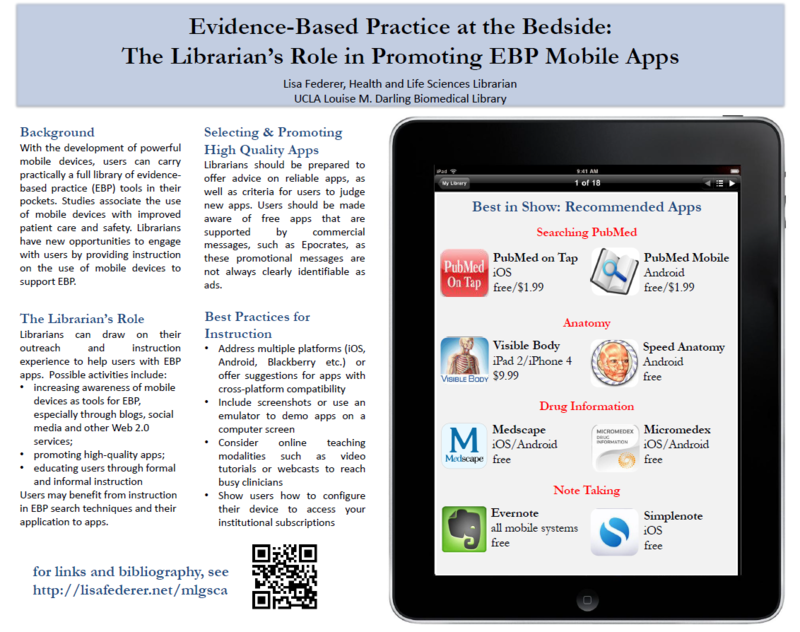 Virtual Poster 4: Evidence-Based Practice at the bedside: The librarian’s role in promoting EBP Mobile apps. As mobile devices become increasingly ubiquitous and new apps are developed to support evidence-based practice, smart phones and tablets have begun to make their way into clinical settings. Though much of the health-related research on mobile devices has focused on patient use, early investigations into the use of mobile devices at the bedside are encouraging. –	Educating clinicians through one-on-one and group instruction, online tutorials, and other teaching modalities. This poster will address these issues, in addition to suggesting best practices for instruction on using mobile devices and providing a list of selected high-quality apps. Trying to bring the “powers that be” into the world of tablets @ the bedside is a challenge. This will be helpful to show the need for such “gadgets” for point-of-care medicine. The first thing I noticed about your poster was that it was visual appealing with just the right amount of information and a pleasant color palette. As more and more clinicians accept the guidance of librarians who have invested the time to be sources for increasing “evidence-based practice at the bedside” the winners will be the patients receiving better care as long as the clinicians remember to continue to interact directly with the patients and not get caught up with their mobile devices.